MOSCOW, October 26. /TASS/. Russian scientists want to protect cosmonauts from the solar wind in inter-planetary flights with the help of magnets, according to a program of joint work of the Reshetnev Information Satellite Systems and the Siberian branch of the Russian Academy of Sciences obtained by TASS on Friday. 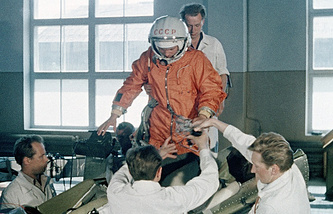 "The research into possible methods of the magnetic protection of manned missions," the document says, indicating the area of the research. "A magnetic dipole [the system of two magnetic charges] is the sole method of protection that can be implemented in the foreseeable future," the document says. "The knowledge of the shape of the magnetosphere, the areas of plasma penetration, induced currents depending on the intensity of the solar wind, especially during flares, is required to accurately calculate magnetic protection and choose the optimal seat for the crew and such equipment as antenna and solar panels," according to the document. "In order to get the required information, it is necessary to carry out model experiments to create a map of the plasma density and speed around the dipole and work out recommendations on safety and technical conditions," the document says, noting that the research should be carried out in 2019-2022. As was reported earlier, the Reshetnev Information Satellite Systems Company and the Siberian branch of the Russian Academy of Sciences signed a program of joint work for 2019-2024 to carry out scientific, technical and innovative cooperation. The program aims to implement a whole set of joint research and developments aimed at increasing the efficiency of the work to create promising spacecraft based on advanced technologies and competitive on the world market.